Yesterday, The European Court of Human Rights elected amongst its midst a new President, the judge in respect of Italy, Guido Raimondi. He will take office as of 1 November, succeeding current President Dean Spielmann. Judge Raimondi has been working at the Court since 2010 and before that in the early 2000s in an ad hoc capacity. He was also, amongst others, active within the ILO. He wil be the Court's fourth president in four years - a much higher turnover than the average in the earlier decades of the Court's history. For more background information about judge Raimondi, please see the Court's press release. Congratulations to the new President! On the same day two new vice-presidents were elected by the Court. As of 1 November, these will be: Işıl Karakaş (judge in respect of Turkey) and András Sajó (judge in respect of Hungary). In addition, two new section presidents were elected: Mirjana Lazarova Trajkovska (judge in respect of Macedonia) and Angelika Nußberger (judge in respect of Germany). All of this taken together means that the Court will have an almost entirely new top layer, due to many experienced judges' mandates terminating. The institutional memory is of course also guarded by the registry, but to maintain a balance between judges and registry, this poses new challenges. And something completely different: partly ECHR-related, event is a conference organized bon 22-23 October in Poland on 'Damages for violations of human rights - domestic, comparative and international perspectives'. More info, also on participating, can be found here. Much of the discussion in the past years around the European Court of Human Rights and about human rights in general in the media and even among some academics has been based on misperceptions coming from a lack of informed views. In order to counter these misperceptions, Adam Wagner and his team of the valued UK Human Rights Blog have launched a special website some time ago which elucidates key human rights issues by way of clear and appealing infographics. 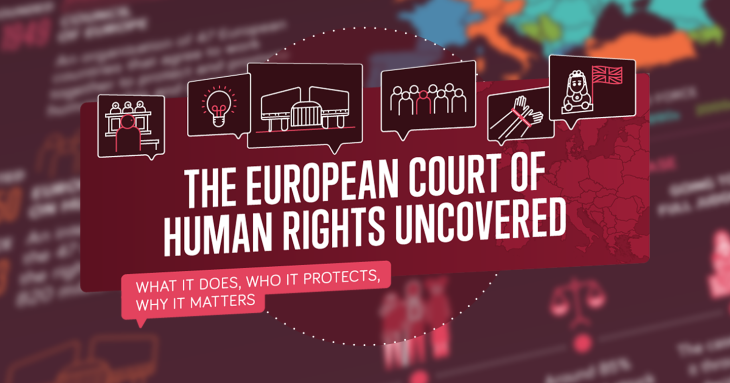 They have recently added a set on infographics entitled 'The European Court of Human Rights Uncovered' with a lot of easily accessible information. While mainly geared towards a UK audience, the country were some of the most vitriolic views about the Court have been uttered in the past years, it is of great interest to the whole of Europe. The page includes information about when countries joined the ECHR system, which countries do relatively well and which ones do not, and on how much the whole system costs. 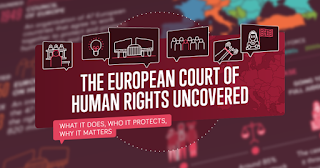 While the infographics have some very minor flaws (Kosovo does not exist yet on their map of Europe and Malta has invisibly disappeared into the Mediterranean), it is on the whole a very well done overview of some key ins-and-outs of the ECHR system. Well worth to take a look at and to spread further! On October 22 and 23, the University of Tampere in Finland is organising a workshop on the European Court of Human Rights for doctoral students. The University would like to invite ten to fifteen doctoral students from different universities. The workshop is intended for students who are doing their research on the European Court's case-law. Doctoral students at different stages of their dissertation process are invited to share their experiences and discuss the specific questions typical to the ECHR-related research. There are prominent Finnish and foreign ECtHR scholars that are hosting the workshop sessions and sharing their good practices. The workshop is organized by the Research Group of Public Law in co-operation with the Doctoral Network on Realizing Human Rights. For additional information please contact Jukka Viljanen, University of Tampere, e-mail: jukka.viljanen at uta.fi . Please note: the deadline for registration is 11th September 2015. To register fill in the form here and send your abstract proposal related to the session themes to Heta Heiskanen (heta.heiskanen at uta.fi). Participants will be chosen based on their motivation and abstract proposal in the event that the number of registrations exceeds fifteen people. 17.00-18.00 ECtHR Poster Café: participants are invited to provide posters introducing their research and its relation to the European Court of Human Rights to other participants. 9.45-16.30 Workshop meetings with doctoral students and senior staff. All participants are to present a 1000-1500 word presentation related to topics in one of the sessions. There are also prepared presentations on good practices from those who have done their dissertations. How the changes in a society should be reflected in the research on European Court of Human Rights? How the Brighton Declaration can be seen? Disguised or concealed change of interpretation? What kind of different approaches there is within the ECtHR research? What is the role of academics in developing the doctrines? How should we understand key concepts e.g. margin of appreciation? 15.30-16.30 Final session. Summary discussion: What have we learned?